For the opening Black Stone Cherry played Black Sabbath’s Paranoid from a cassette tape! There’s nothing like analog rock n roll! It was cool hearing a cassette recording of Black Sabbath on the hanging concert speakers. It transformed the Hippo into a giant stereo. Since Black Stone Cherry was the opening act they played a quick set. About eight songs with a couple covers, Evil by Howlin Wolf, and I’m Your Hoochie Coochie Man by Willie Dixon. They’re good ole American hard rock band. The latest album, Family Tree, continues that tradition. Chris Robertson carries a heavy blues guitar rhythm with a lot of soul in his voice. It’s powerful feel good music. The song Carry Me on Down the Road had that feel. The Hippo is a great place to see a concert! Firstly, you’re ALLOWED to take beer and double shots of whiskey to your seat! That’s not usually allowed in Theaters and “Performing Arts Centers.” This was great for vocally interacting with the performance. The theater acoustics held the sound extremely well so even if you were drunk and yelling at the top of your lungs Gov’t Mule was drowning you out with wicked guitar and organ solos. It was like a jazz monster truck rally; you couldn’t hear yourself think! It fit right along with the title of Mule’s latest double-album; Shout! The album Shout! goes over the top with rock n roll all-star guests. It features re-interpreted new Mule songs from: Elvis Costello, Dr. John, Ben Harper, Toots Hibbert, Glenn Hughes, Jim James, Myles Kennedy, Dave Matthews, Grace Potter, Vintage Trouble’s Ty Taylor and Steve Winwood. Mule released an all-star double-album in 2001 dedicated bassist Allen Woody, The Deep End. It featured Jack Bruce, from Cream, John Entwistle, Les Claypool, Flea, Chris Squire and Stefan Lessard of Dave Matthews Band among others. That’s not even all the artist who have worked with Mule by a long shot. Other notables include: Victor Wooten of the Flecktones, Jason Newsted formerly of Metallica and Dave Schools of Widespread Panic. Chances are if you are a prominent rock n roll keyboardist or bassist in the 90’s/2000’s, you ended up working for the Gov’t. 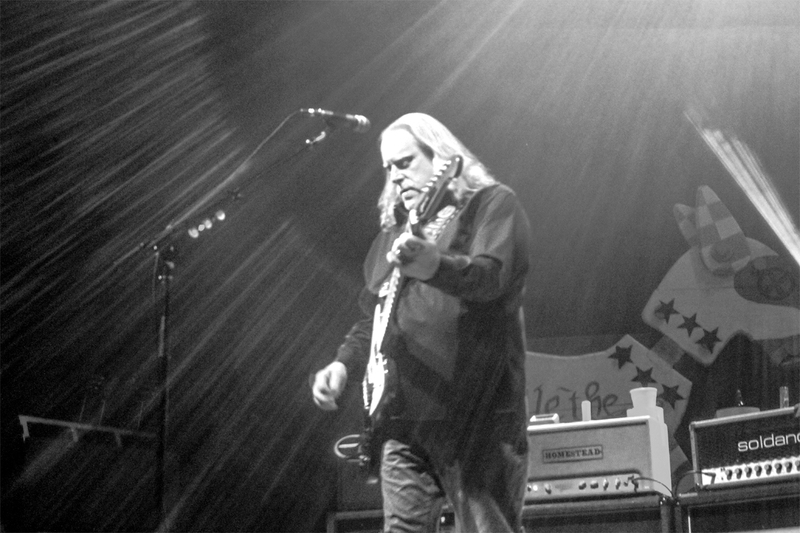 Recordings aside Gov’t Mule’s live performances are an experience their own. Tonight they went on to play two entire sets! And then an encore! You definitely got some bang for your buck! Their line up was Warren Haynes with drummer Matt Abts, keyboardist-guitarist Danny Louis and bassist Jorgen Carlsson. They also had a guest harmonicist Hook Herrera. It was spectacular the way the harmonica and guitar blended together in songs like Guilty. They even did an Allman Brother’s Band cover Don’t Keep Me Wondrin’ with harmonica. Sometimes the harmonica and guitar blend so well together it’s hard to tell them apart. Hearing the bass and organ compliment each other in songs like Revolution Come, Revolution Go was mesmerizing! Speaking of bass, the song Devil Likes It Slow is a fascinating display of bass skill. Jorgen Carlsson nailed it! I can see why so many hall of fame bassist have played with Gov’t Mule. Warren Hayes guitar on that track is mind blowing as well. It was my favorite song played all night! They played so many incredible songs I can’t even go over them all. Mule, Easy Times, Cold Stone Rage, Steppin’ Lightly, Brand New Angel, Painted Silver Light, Drawn That Way, the list goes on. The best part of their live performances is just how astonishing they sound. Warren Hayes is an unbelievable guitarist, Danny Louis on keyboard/organ was dynamite. It’s hard to tell who stole the show. They all took their turn. All in all, Gov’t Mule is a great concert that will leave you amazed.